One of the best parts of brewing is taking an idea and helping to make that concept a reality. Inspiration can come come from many places – sometimes it arrives from out of nowhere, like a lightning bolt of realization. Other times it can be something familiar seen in a new light. Or, sometimes developing something new comes from a careful and measured process, executed one step at a time. To move these new ideas from a concept to a reality, we make a Prototype. 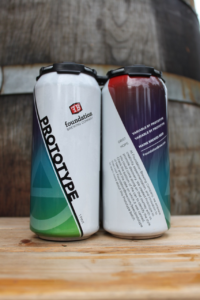 Available in cans, Prototype is the 16 oz. physical manifestations of these ideas, designed to be shared and enjoyed. This series of beers will vary from batch to batch, allowing you to join us in the creative process. The cans will be stamped with their packaged date and the style of beer on the bottom. We will also have notes and specifications for each batch of Prototype on our website, organized by date. Come share with us the thrill of exploration and discovery!